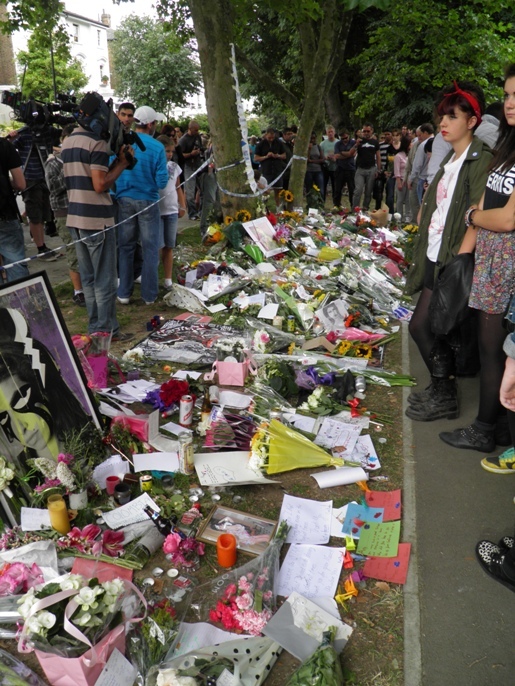 The first sign that a vigil is ongoing in Camden Square comes on nearby Murray Street. 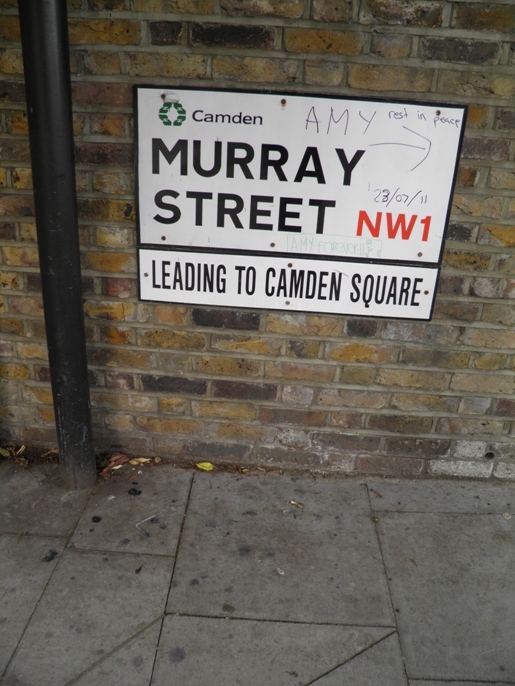 Someone has added something to the road-sign in pen: “Amy”, followed by an arrow pointing towards the house in which she lived. 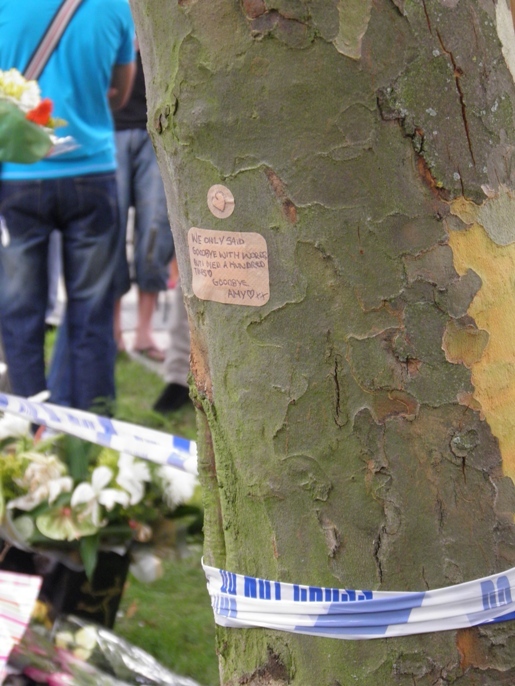 Since her death sometime in the early afternoon of Saturday 23rd July, the small strip of grass opposite No. 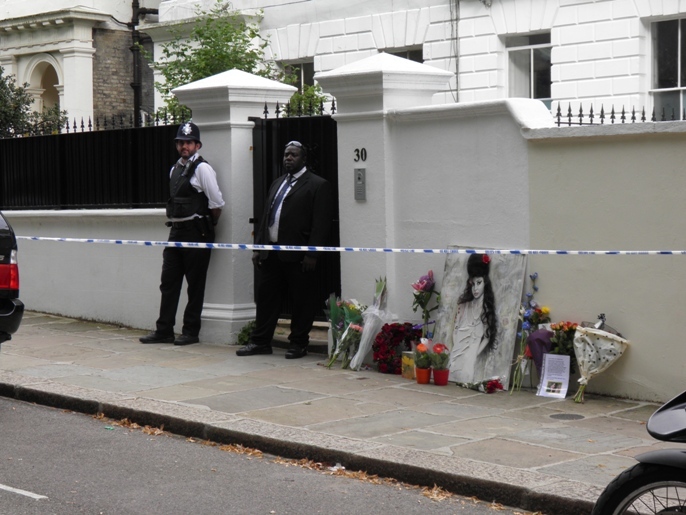 30 Camden Square has transformed into a shrine to Amy Winehouse. Three days after her death, the road is choked with TV vans with vast satellites on their roofs. Spanish students lounge around, hugging one another and making peace signs into iPhones. Cyclists slow down to look at the crowd. Despite the hundred or so people standing around – waiting for something, but quite what it is, no-one seems sure – it’s incredibly quiet. The main voices to be heard are those of TV reporters – no British ones on the scene by Monday, just American and Australian entertainment stringers filing back reports to unseen studios. 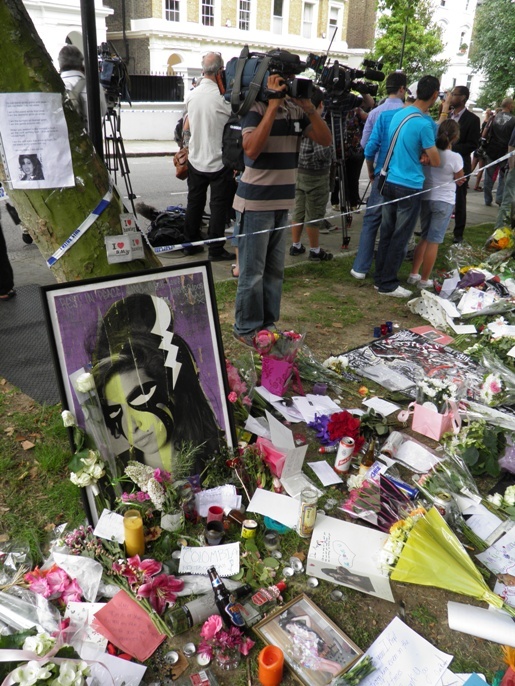 It’s not funereal as such, but there are no MP3 players, no radios, and no one singing any of the songs so intimately associated with the woman whose death has brought them here. 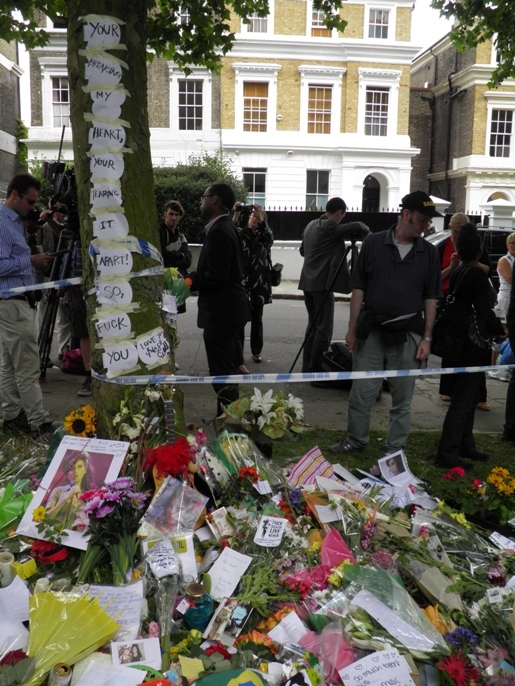 Instead, there’s a sullen, hugely respectful line of people filing by the 18ft of mementoes that have collected at the entrance to the park which Amy Winehouse’s home looks directly out on. The singer’s face beams back from dozens of photocopied photographs taken with fans over the years; with drawings of her famous beehive and thick kohl eyelashes; with handwritten notes; and with the occasional large painting celebrating the icon she’d become some time before her untimely death. 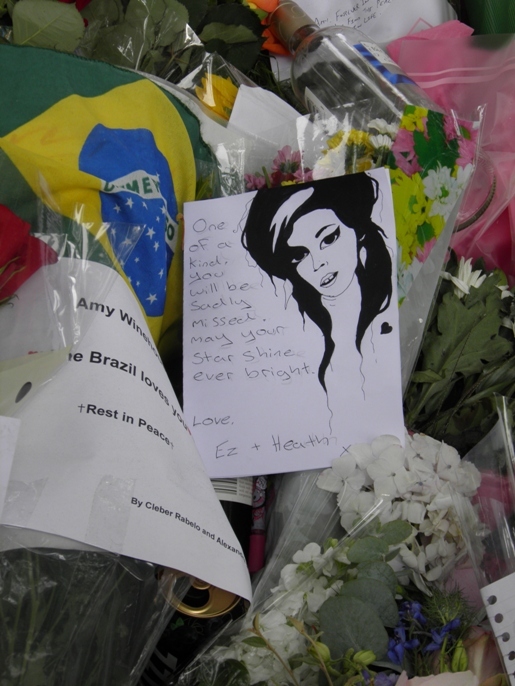 Despite working in music radio for years, I only ever saw Amy Winehouse once – and naturally it was in Camden. Coming down from the private room at the top of the Hawley Arms much too late one Friday night a few years back, I passed her on the stairs, small, tottering on massive heels, resplendent in a clingy black and white checked dress. It wasn’t a special moment by any means – it just seemed like the natural order of things. 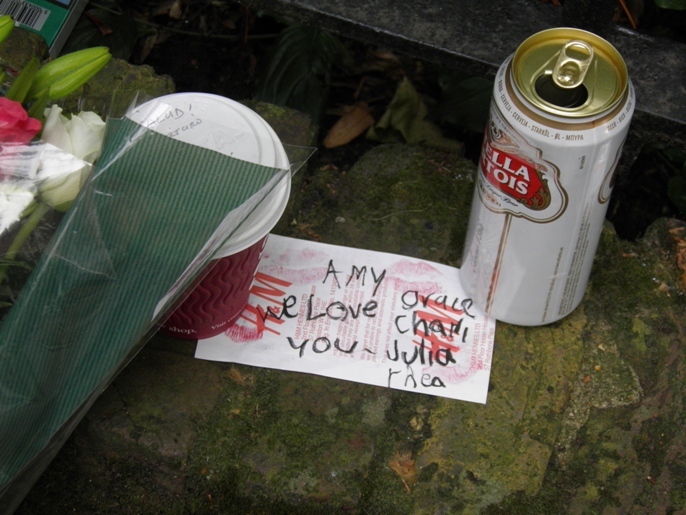 You went out drinking in Camden every so often and, sooner or later, you’d see Amy Winehouse. She was one of the few contemporary musical acts to be intimately associated with a specific area of London. Camden and Amy; the two were synonymous. Drugs, vintage clothing, live music, rough boys, late nights, hard drinking – it’s hard to think of another star whose attributes match so exactly the place where they lived. 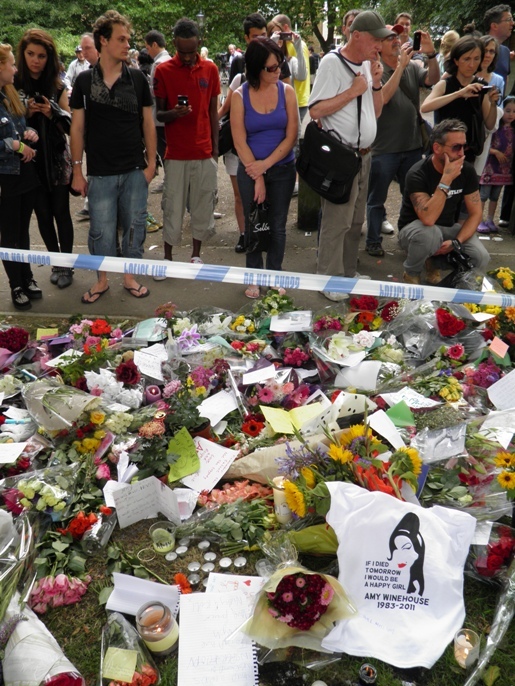 Three days before her death, her final on-stage appearance was fittingly at the Camden Roundhouse, where she sang with her goddaughter Dionne Bromfield as part of the iTunes Festival. Camden was the melting pot where she created her internationally celebrated work Back To Black; it would also be the last place her majestic voice would ever be heard. I pondered taking a photo, but as the rain started to pick up, I skipped past and headed for the station. 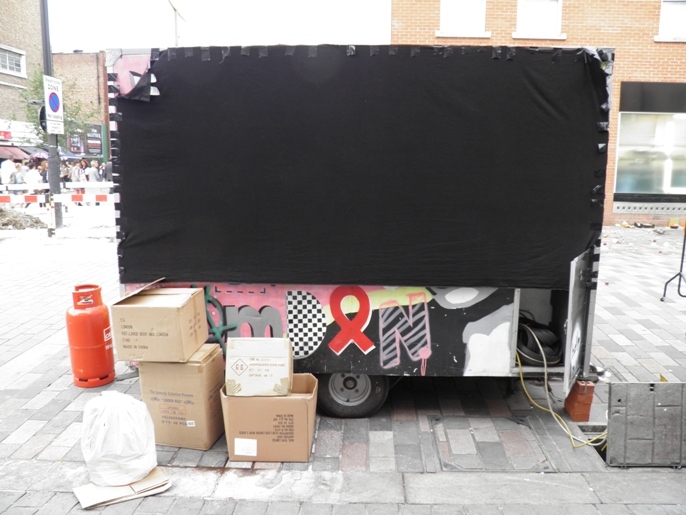 When I walked back past it today (the record shop immediately behind playing You Know I’m No Good loud enough so that it could be heard by anyone passing by), the stallholder had covered the whole thing with a black sheet. Whether it was a tribute or just to keep the tourists and their pens away from his stall, I don’t know, but it seemed apt. 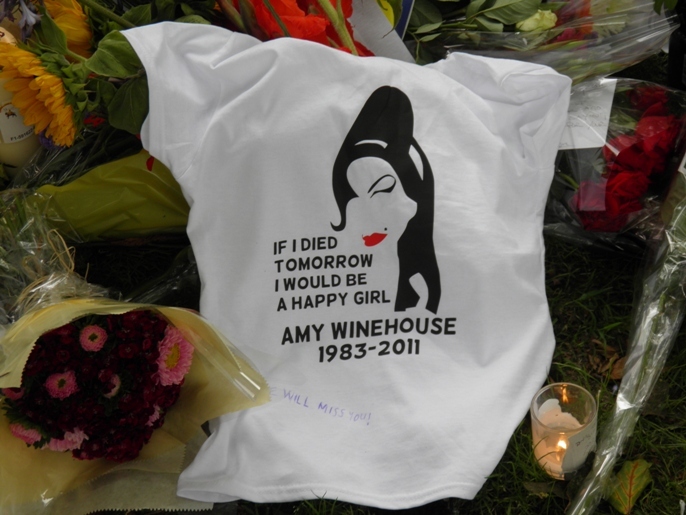 Further up the road, the probable future of the Amy Winehouse brand was prominently displayed. 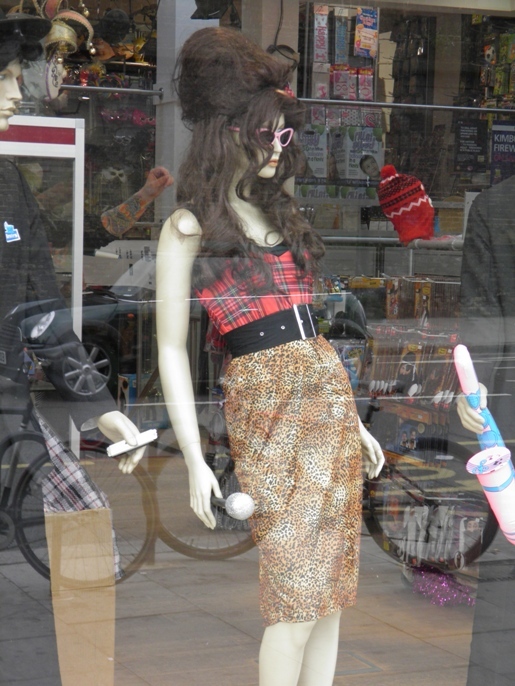 In the window of Escapade, sandwiched between two Blues Brothers, was the Winehouse fancy dress kit. The tragic story of a phenomenally talented young woman is boiled down to a beehive and a microphone you can wear at a hen party. 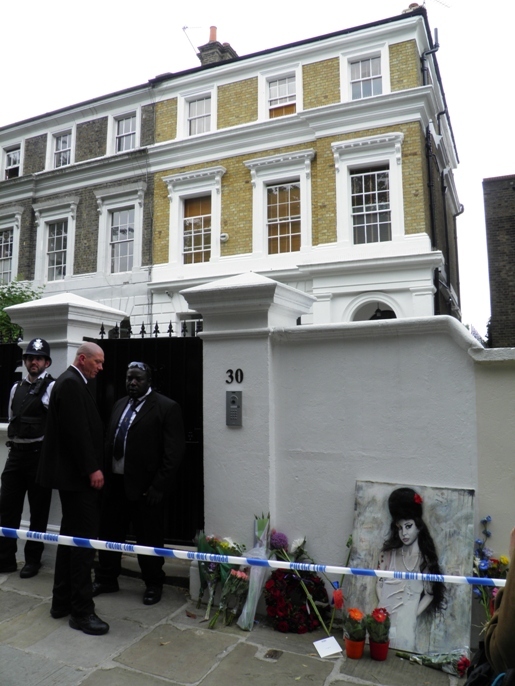 The house in Camden Square will undoubtedly become the newest exhibit in the London rock tour, another pilgrimage site filed alongside the residences where Mama Cass and Jimi Hendrix expired. The graffiti appearing on the road-signs this weekend is just the start. As soon as the police tape is rolled up, the wall of No.30 is going to be scribbled on by people from all over the world. 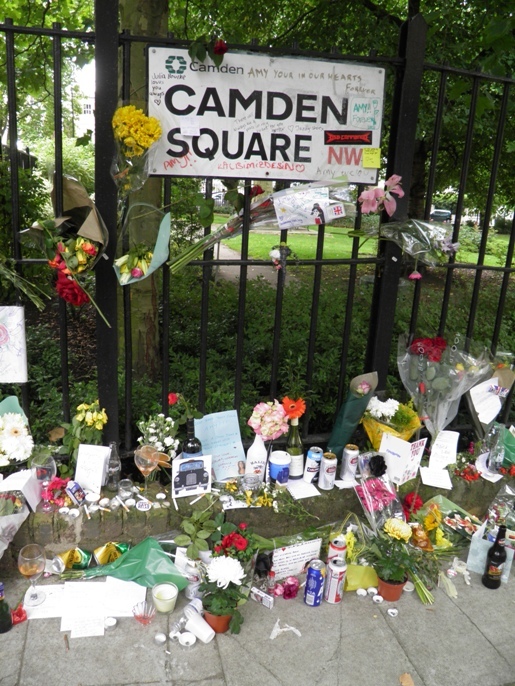 The residents of Camden Square will have to get used to stepping over half-melted candles and soggy hand-written notes scattered across the square. The house will become as essential a Camden destination as Stables Market and the Electric Ballroom. 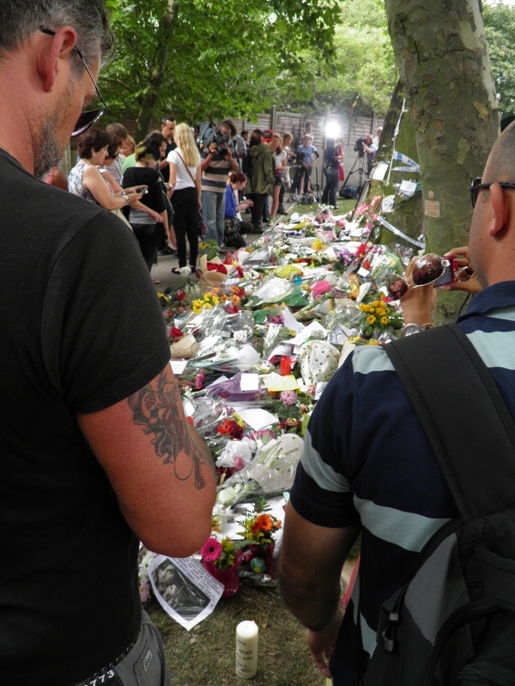 Walking round the collection of letters, photos and drawings that celebrate her life in Camden Square, a man in his sixties pointed out a glass of rose to his wife. “She liked a drink, that’s true! She certainly liked a drink!” As he pointed, his voice suddenly cracked and he started to sob. There is something undeniably moving about the piles of single cigarettes, the half-size bottles of vodka, the nicorette patches plastered onto the trees, and the half-full wine glasses standing up on the grass. It seemed to me like the communal equivalent of everyone getting together in a pub to toast the deceased after the funeral. It’s just so terribly sad. There’s nothing else to say. 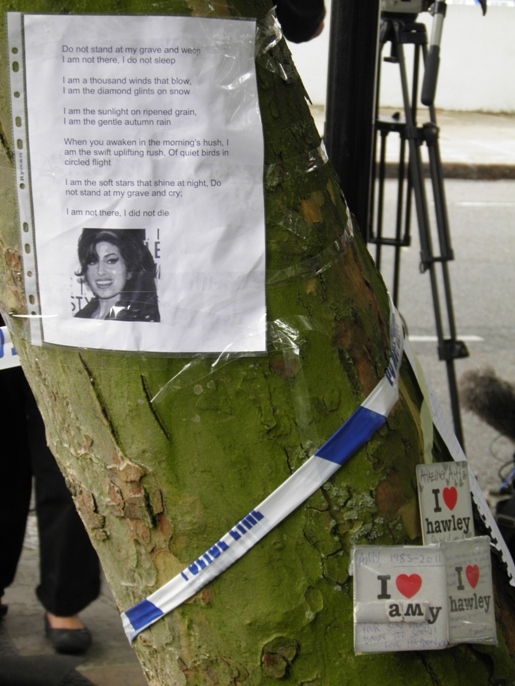 As the days went on, ten of the road signs around Amy Winehouse’s former home (the first photo in this post shows the sign two days after her death) became completely covered in graffiti from fans. The Ham and High reported that four were taken by souvenir hunters, who ignored pleas from Camden Council to return them so they could be passed on to her family.